A four-day Transformation Lab (T-Lab) recently hosted by the Centre for the Study of Complex Systems in Transition (CST) and the Southern African Food Lab brought together a group of nearly 40 academics, farmers, chefs, entrepreneurs and social activists to imagine ways of shifting a food system that in many ways appears entangled in deep social and ecological crises. The T-Lab, held amidst the natural beauty of the Western Cape, at the Fynbos Retreat near the Grootbos Nature Reserve in the Overberg coastal mountain range, aimed to help build connections among participants of diverse backgrounds, knowledges and perspectives, while challenging them to deepen their thinking about the food system — simultaneously building capacities to imagine radically different food futures, and to bring about practical, tangible changes in the present. 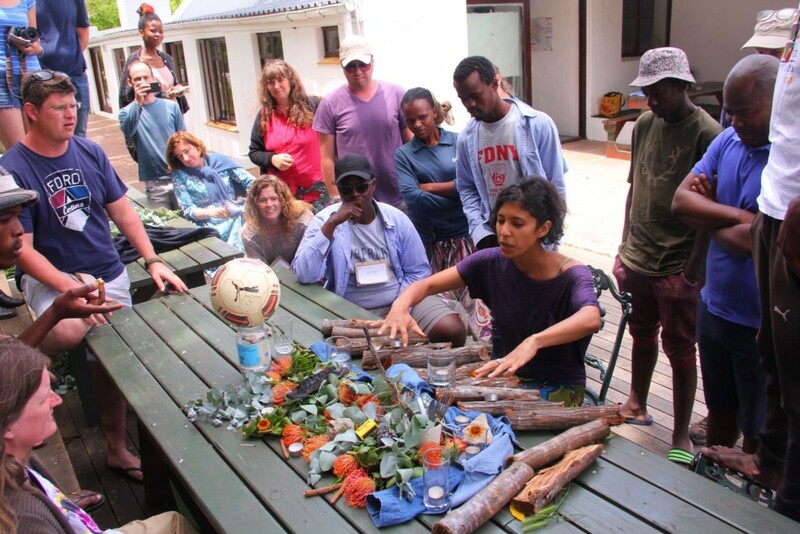 The T-Lab was facilitated by Dr. Scott Drimie of the Southern African Food Lab, Dr. Laura Pereira of the CST, and Dr. Per Olsson and Dr. Michele-Lee Moore from the Stockholm Resilience Centre. How do we change our relationship with the natural surroundings, given conventional farming practices that prevail in the uniquely biodiverse fynbos plant kingdom? How can changes in mindsets and values begin to shift the webs of interactions that make up highly complex food systems? How can there be greater accountability and transparency in a heavily globalized food system where feedbacks are often distorted or far removed? What forms should governance of food systems take? More work is needed to investigate what happens in the middle of the value chain where power is concentrated among a small number of distributors and retailers, and how this contributes to low prices for farmers and high food prices for consumers. The exploratory format of the T-Lab workshop was designed to be both creative and challenging, and to allow difficult conversations to surface, often provoked by participants’ different visions of how change might happen and what kinds of changes are desirable. Using a framework called the 3 Horizons, participants were challenged to grapple with how to nudge the system away from its current trajectories and towards more desirable alternatives. In the framework, the First Horizon represents the dominant system in its current trajectory. The Second Horizon reflects the emergence of changes and innovations that begin to make aspects of the First Horizon less tenable. The Third Horizon represents radical innovations that will reshape systems in the future. In an immersive process of playing with this framework, participants then broke into small groups and foraged for different materials to build models to represent a desirable future food system for the Western Cape, which they then had to explain concisely to the group, and receive criticism. In this process of building stories and models of the future, participants were under pressure to justify and interrogate their own visions and assumptions around transformation. In less pressurised segments of the T-Lab, participants got to know one another, exploring the indigenous fynbos landscape on a morning walk led by indigenous food activist and farmer Loubie Rusch, gathering such delicious yet little known edible ingredients such as dune spinach, samphire and vyggies that were turned into supper later that evening, in a cook-off between several chefs in attendance. This immersion in the local landscape enabled some participants to see anew. In terms of local conventional agriculture, some participants remarked that fynbos land, with its poor sandy soils, is often seen as worthless, despite its being one of the world’s most biodiverse plant kingdoms. One aim of the workshop was to bring participants together to collaborate on practical moves towards building food system alternatives. Following the T-Lab, for example, Jeremy Barty, founder of BREADrev, a social enterprise using efficient bread ovens to make nutritious, low-cost bread available, had connected with Khayelitsha-based social innovators Xolisa Bangani and Athi Mbongi and installed a new bread oven at the Ikayha Garden site at Isikhokelo Primary School.